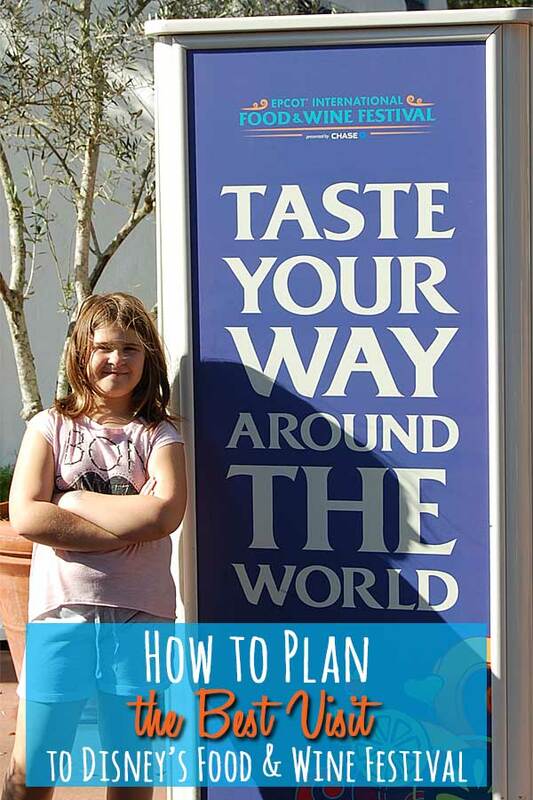 The plan of attack was set for my third trip to the Epcot Food and Wine Festival in Walt Disney World. My first two visits consisted of a haphazard sampling of goodies I knew I would enjoy. This year, my daughter and I set out on a mission to try as many new and different eats as possible. The festival takes place every year from late September to early November. 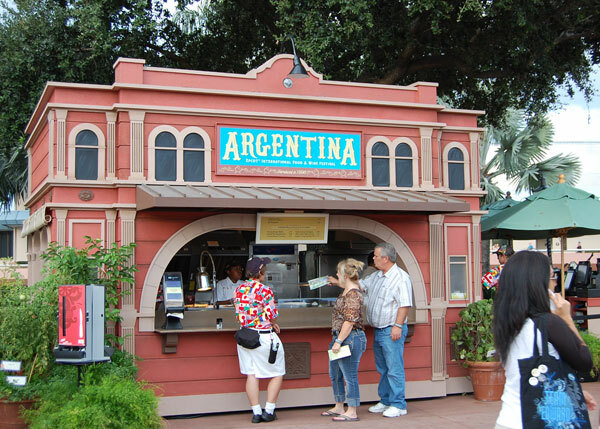 Mini eateries featuring traditional and renowned delicacies and drinks from more than 20 countries are set up as kiosks throughout the Epcot World Showcase. Bratwurst in Germany, potstickers in China. It’s a costly endeavor, with appetizer-sized portions ranging from $4 to $8. But as a firm believer in the culinary aspect of travel, I willingly dished out a few extra bucks. To put it in perspective, my daughter and I arrived bright and early and ate only Festival food for the entire day. We spent $100 and tasted food from 10 of the 26 kiosks. We typically purchased one entree and one dessert each time and shared. By nightfall, I was in a pleasant food coma. To sample from each country, I estimate we’d need close to $300 and two or three days. Cost aside, the experience of the Festival was classic Disney. Workers were efficient, pleasant, and often (always?) spoke the native language. 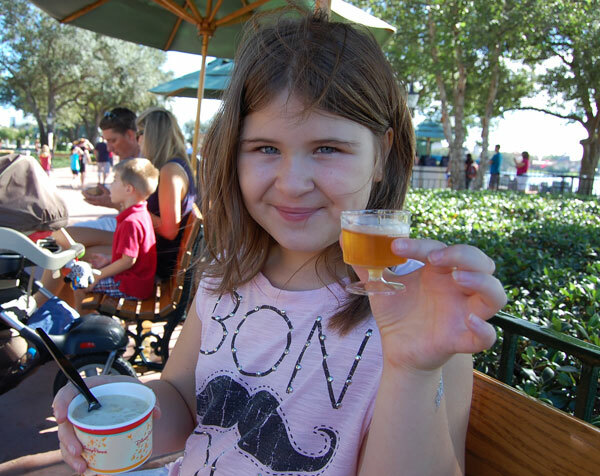 My daughter delighted in trying out a few French phrases when ordering her creme brulee. Even after attending three times, I still haven’t experienced even a quarter of what the Festival has to offer. There’s a concert series, culinary demonstrations, and special dining experiences with celebrity chefs. But I think I’d be satisfied by accomplishing my goal of trying out every kiosk. Our favorites? Scotland’s salmon with cauliflower puree and France’s beef bourguignon topped my list, while my daughter asked for seconds of France’s crème brulee and Argentina’s skewered beef with chimichurri sauce. Looking for more to do in Orlando? Set a budget. 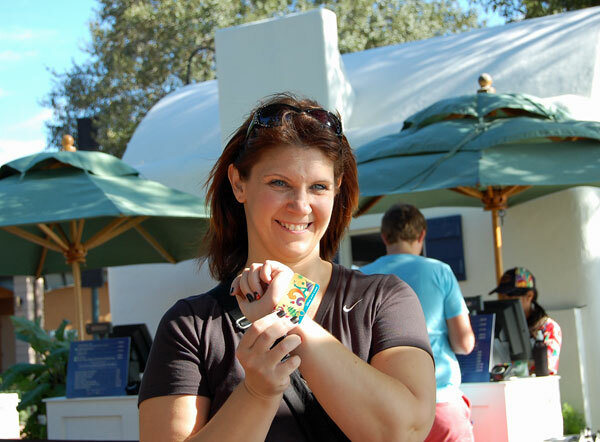 I loaded a Food & Wine Festival gift card with $100 – my budget for the day. I carried the card around my wrist, making purchases a snap. People-watch. 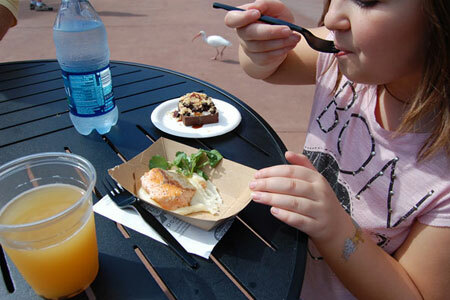 Watch people leaving the booths and sneak a peak at their food and drink. I purchased a “grilled cheese” entree in Greece that was exactly that – a chunk of cheese grilled in oil. My American brain was expecting some sort of bread there. Had I seen the entree, I might have skipped that one. Another reason to scope out the food: Some drinks are more substantial than others, and portion sizes do vary. After paying $5.75 for this tea-party-sized La Face Neige Apple Ice Wine, I paid more attention to the beverage options. Beer is the way to go. When a country offered a truly unique beverage – like the lychee drink in China – I had to splurge. Otherwise, I found the craft beers to be reasonably priced and outstanding in taste. I discovered Leinenkugal’s Orange Shandy, a refreshingly light brew that cost $6.75 for 12 ounces – not too far off what you’d pay in a restaurant. Night time is party time. The Festival really ramped up in the evening. The park was relatively empty on that Friday in early November – until after 6pm when it turned into one big happy hour! If you’re traveling with kids – take note! If you’re enjoying the Festival with friends – huzzah!